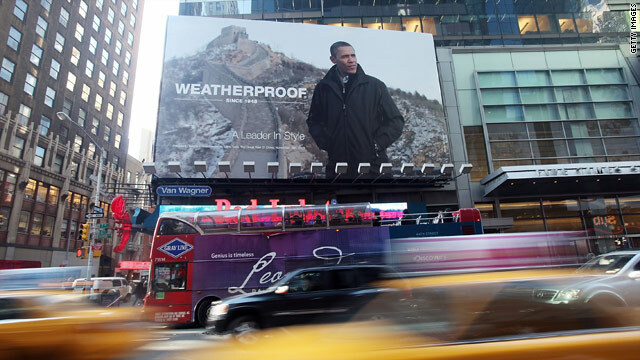 A billboard ad with a photo of President Obama wearing a Weatherproof brand jacket hangs in Times Square January 7. Company spokesman: Ad will be removed "in an expeditious manner"
New York (CNN) -- A billboard featuring President Obama that was erected three days ago will be coming down, according to a spokesman for the company that paid for the outdoor ad in Times Square. Weatherproof Garment Company, which licensed an Associated Press photo of the president wearing one of the company's jackets, had intended to leave the Times Square ad and another in midtown Manhattan for two months. "It's my understanding that the counsel's office spoke with the company and that the company is supposed to take that ad down," White House spokesman Robert Gibbs said Friday. The billboard towering over Times Square features a photograph taken during Obama's November trip to China and depicts the president with a snowy Great Wall of China in the background. It was snapped by AP photographer Charles Dharapak. The Weatherproof billboards have become part of a larger discussion about celebrity, politics, public figures and advertising that surfaced last month when People for the Ethical Treatment of Animals launched an ad campaign featuring first lady Michelle Obama. Weatherproof President Freddie Stollmack said the company didn't expect the amount of controversy over billboards and that Weatherproof was never looking to get into a fight with the White House or President Obama over the ads. He called the creation of the ad campaign "serendipitous." "We saw a picture of President Obama visiting the Great Wall of China and we said, 'Boy that looks like our coat,' " he said. The New York Times, the New York Post and Women's Wear Daily rejected print versions of the ad, Stollmack said. "There is no First Amendment defense here," said intellectual property lawyer Barbara Solomon. "This is not an issue of expression. This is a pure commercial appropriation. This is an advertisement and nothing but an ad." Stollmack argued that the billboards aren't "an ad in a traditional sense," saying they just feature "a great depiction of President Obama wearing the Weatherproof coat on a billboard." "From a legal point of view, it's not legal," she said. "It is a violation of Mr. Obama's right of publicity, his right to control his appearance and his likeness." Images of public figures, whether they are presidents, first ladies, movie stars or singers, can generally be used by news organizations however they wish, provided they own or license the image. But advertising is a different matter. When Weatherproof licensed the photo, AP spokesman Paul Colford said, the business transaction required the clothing company to seek specific permissions and consent for using the photograph. "In this case, whatever clearances they may need from the White House," Colford said "We simply licensed the photo." Use of the photo of the president is purely a means to garner "additional buzz" for the company, said Nancy Tag, an advertising professor at The City College of New York. What's "so fascinating about this billboard is that it looks so traditional ... but it's really a form of guerilla marketing because they are in such clear violation of industry standards," she said. The White House hasn't had much success stopping PETA from running posters that feature the first lady alongside talk show host Oprah Winfrey, country singer Carrie Underwood and supermodel Tyra Banks in the animal rights group's "Fur-Free and Fabulous" campaign at Washington Metro stations. PETA President Ingrid Newkirk acknowledged knowing the group was close to crossing the legal line with the posters, but said the posters will stay up for four weeks as planned. "But the fact is that Michelle Obama has issued a statement indicating that she doesn't wear fur, and the world should know that in PETA's eyes, that makes her pretty fabulous," the group said. The first lady's deputy press secretary, Semonti Mustaphi, told the Washington Times in June that "Mrs. Obama does not wear fur." Newkirk said the organization has insisted on keeping the promotion going because the ad is not selling anything and the group paid for the rights to the image. "It's complimentary," Newkirk said, calling the first lady a "gorgeous person." PETA said the group had prior relationships with the other three women in the poster but said it "knew we could not get an endorsement from ... the first lady because of her position." Paul Rosengard, former president of Perry Ellis who now teaches fashion industry marketing at the New School's Parsons School for Design, said he understands the appeal of using images of the first couple. "The end goal in advertising is to create a buzz about your brand," he said. Weatherproof spokesman Cohen acknowledged as much. Rosengard said he believes Weatherproof deserves some kudos for trying something different -- "It is brilliant and it is working," he said -- but added that he isn't sure whether the billboard is legally or morally acceptable. It "flirts a little too closely with that ethics line," he said. Weatherproof spokesman Cohen said the Times Square billboard will be in place for about a week longer because the company isn't allowed to leave the space blank.